Editor's note: This is an updated version of a story first published July 4, 2015. 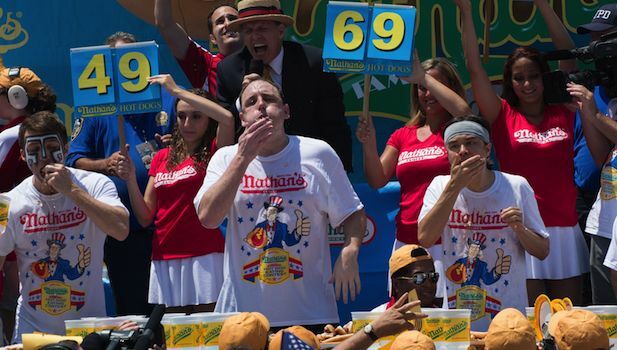 At the 2018 Nathan's Famous Hot Dog Eating Contest, held every Fourth of July on Coney Island in Brooklyn, New York, Joey Chestnut claimed his 11th victory by devouring a world record 74 hot dogs and buns in 10 minutes, topping the record he set last year. In the women's competition, returning champ Miki Sudo downed 37 for her fifth consecutive win. The thought of it is enough to make any normal eater queasy. So how do these competitive eaters manage such extreme gorging? There is not a lot of research on competitive eating and this sport continues to baffle scientists and doctors. However, small studies from gastroenterologists have provided some information. According to an article in Gastroenterology and Endoscopy News, "After being swallowed (competitors have dozens of swallowing techniques, such as "chipmunking," in which they puff their cheeks out as they stuff their mouths full of food or gulp big bites followed by sips of water), the food mass moves through the esophagus, a portion of the route that takes about 10 seconds to traverse for the first mouthfuls and longer for every swallow afterward as the esophageal pipeline fills up." Competitive eaters have to learn how to relax their esophagus so that it expands, allowing more food to go down. From there, the hot dog travels to the lower esophageal sphincter (LES), an involuntary bundle of muscles at the low end of the esophagus that prevents acid from getting into the stomach. Competitive eaters have developed various techniques for relaxing these muscles. In the 2006 book on competitive eating called "Eat This Book," author Adam Nehr writes that competitive eating champion Don Lerman learned to overcome nausea when food hits his LES and relax the sphincter by downing a gallon of water every morning. Then, once the food passes the LES, it enters the stomach. A normal eater has a stomach that feels full after consuming about a liter or a liter and a half's worth of food. Competitive eaters learn to stretch and relax their stomachs to fit in more food by eating large amounts of low-calories foods and liquids including water, diet soda, watermelon and cabbage. The stretching does not go on indefinitely, however. As with any competition there will be losers and all competitive eaters will stop when they've reached their limit. And they might not feel too good afterwards. The side effects of such binges vary based on the competitor and the food being eaten. Gastroenterology and Endoscopy News states that hot dogs cause the most painful cramps. Other side effects of competitive eating include nausea, painful gas, vomiting, heartburn and diarrhea. More serious side effects could include choking, esophageal inflammation and stomach rupture. There are always emergency medical technicians on hand during eating competitions in case there is a problem. "Safety is a huge consideration for us," George Shea, emcee of Nathan's Hot Dog eating contest told CBS News before the 2015 competition. Organizers of the competition go over the risks and issues with eaters prior to the competition and all contestants have been professionally trained. "It's the most intense contest of the year," Shea said. "Generally, after an event eaters are emotionally and physically wiped out and want to take a nap." But amazingly, the intensity of the competition doesn't stop everyone from continuing to eat. "Sometimes they'll go and have an ice cream after," Shea said.